So…happy New Year. I won’t get into the usual “I haven’t updated because I’ve been so busy” thing. I do intend on keeping this blog and I’ll update it when I can and as usual, hopefully that will be more often. ANYway…I had a precious weekday off and thought it would be nice to meet a friend for breakfast and we picked Sunnyside Cafe. I know it’s silly but I had avoided this place before because it was previously Mel’s Sunnyside. Not sure when it switched to just Sunnyside without the Mel, but I used to work at Norman’s restaurant when I was in High School and Mel is Norman’s brother and it just reminded me of Norman who was mean and the few times I interacted with Mel wasn’t that great either, nothing dramatic but you could tell they were related. I’ll have to make a post about Norman’s sometime even though it burned down several years ago (wasn’t me) and is now a Dunkin Donuts. Inside the Sunnyside is casual and comfortable with booths and tables and nice counter with swivel stools. We sat in a booth since my friend had her 2 year old with her and someone came by with a page from a coloring book and some crayons. The service was very good, not overly friendly but comfortably attentive. 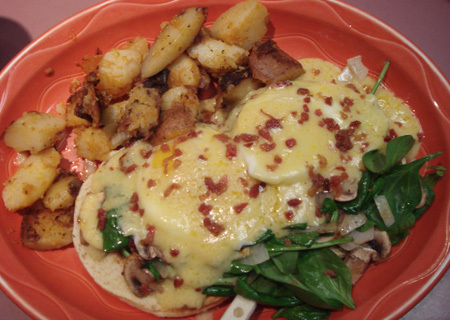 I got..something benedict, I forget what it was called exactly now but it was spinach, onions and mushrooms on Portuguese muffins and hollandaise sauce and real bacon bits. I was going to tell the waitress to leave off the bacond bits but then I figured what’s the difference. I liked that the mushrooms weren’t watery and that they used fresh spinach instead of frozen, chopped spinach. The potatoes were really good too, nicely seasons and a good combination of soft and crunchy pieces. Mindy said the omelet was good, not amazing but did notice the stems of the broccoli were probably from a frozen bag, which is fine but we were guessing before she ordered if it would be fresh or frozen broccoli they’d use. To be fair I don’t think many, places use fresh broccoli in their omelets. The pancakes were fine and mindy’s 2 year old liked them. Also I like that there are substantially sized condiment containers for ketchup and maple syrup at each table. It wan’t spectacular but not disappointing at all and I’d probably go back there again. Thanks for posting this. 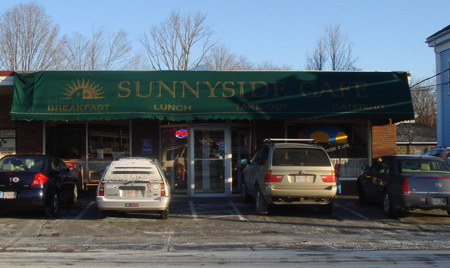 Where is the Sunnyside Cafe? I’m interested in hearing about Norman’s. My dad knew Norman and we went there a lot for breakfast when I was a kid. Then I got older and we stopped going. Never went in to it and it then it turned in to Norman’s Grille (or at least got a new sign). Oops, just saw the Ashland tag, so this must be in Ashland. Oh yeah, it’s at 24 Front Street- Ashland. Thanks for posting! my husband and I really enjoy this place for breakfast! 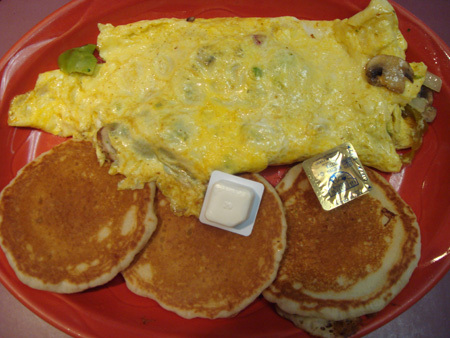 it’s very family friendly, the food & service are good, and the prices are reasonable. People have strong feelings about Norman’s – they either loved it or hated it. this is the first place the hubby and i went when we moved to ashland. i love having a friendly neighborhood place in town. i’m totally hooked on their irish benedict. need to feed the addiction to corned beef hash.